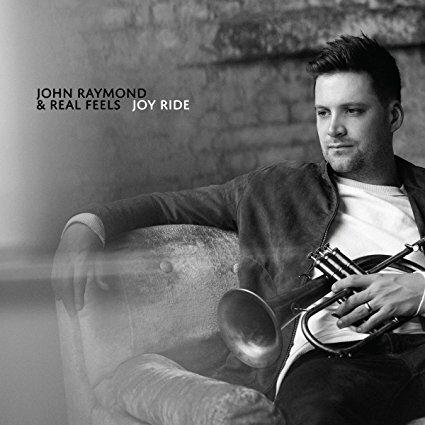 John Raymond & Real Feels have a new album called, Joy Ride on Sunnyside Records. The energetic warmed toned trumpet and flugelhorn player and composer has emerged as one of the most capable jazz musicians on the scene. Raymond regularly performs with musicians such as: Billy Hart, Orrin Evans, Linda Oh, Gilad Hekselman and Dan Tepfer. His mix of modern sounds and the time-honored jazz feelings give Raymond a unique voice in the modern jazz choir. The Reel Feels are: drummer Colin Stranahan and guitarist Gilad Hekselman. Together, the three create a jazz sound that is easy to follow, a joy to listen to and depth, there is a sincere focus of listening and interaction among the players. That’s the short of it! The bass-less trio provides an atmosphere of creativity for the players. Hekselman covers a lot of space and is a master of keeping multiple parts clear and moving. Raymond’s compositions fit nicely in the group setting. His tone is warm and balanced, his maturity of note choices and colorizations are evident. The best part of this trio though is their ability to listen to each other and build music as a group collective. John Raymond & Real Feels are bringing the sounds of today’s world into focus and applying them to the jazz heritage. Using electronics along with their acoustic instruments to build multi-layered compositions that are engaging and easy to listen to. Modern in their use of time signatures, forms and feels, the trio does stay true to the improvisational hall marks of jazz, which is improvising through the changes, interacting in a flowing and conversational way, having a strong rhythmic identity and flow and most importantly, telling a compelling musical story in the moment!